Image Size: 19 3/4"w x 14"h.
Artists become known for signature works and increasingly Dan Smith’s “water” paintings are becoming “must haves” for collectors. As is the case for "Stillwater Crossing," evidently “must haves” for museum collections as well. Dan created this painting specifically for the Eiteljorg Museum’s Quest for the West Art Show 2010. In a strong overall showing of art, Smith’s painting won the show’s Harrison Eiteljorg Purchase Award and is now part of the museum’s permanent collection. It is easy to see why museums and collectors think Smith is doing something special. Water and its qualities are one of the toughest real world experiences to translate convincingly into painting. From the reflective qualities of the placid surface to the bison’s turbulent wake, what you see here is flawless. A true signature work from a highly respected American artist. 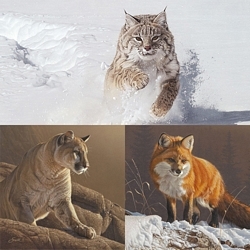 Daniel Smith, one of America’s foremost wildlife artists, enjoys wide acclaim for his depictions of the natural world. He is inspired by his surroundings in southwest Montana and paints from personal experience. He also has had a lifetime fascination with Africa and travels there frequently seeking artistic inspiration. Daniel has been painting fulltime for over twenty years. His works are in the permanent collection of The Hiram Blauvelt Art Museum, Leigh Yawkey Woodson Art Museum and The Wildlife Experience. Daniel participates annually in the Masters of the American West exhibit at the Autry National Center and the Western Visions exhibit at the National Museum of Wildlife Art. He has won numerous awards from The Society of Animal Artists as well as being chosen as “Artist of the Year” for several conservation organizations. Throughout his career Smith has used his art to aid and endorse many conservation efforts. He feels indebted to the natural world that has been the sole inspiration for his award winning career.